In a 62-36 vote, Republicans were able to peel away nine Democrats from President Obama’s position on the pipeline, ensuring easy passage for the bill once it cleared a filibuster. If Obama vetoes the bill as promised, however, supporters do not have the 67 votes needed to override his decision. The pipeline was first proposed in 2008 and would carry oil 1,179 miles from Canada’s tar sands to Nebraska, where it would connect to an existing pipeline and continue traveling south. 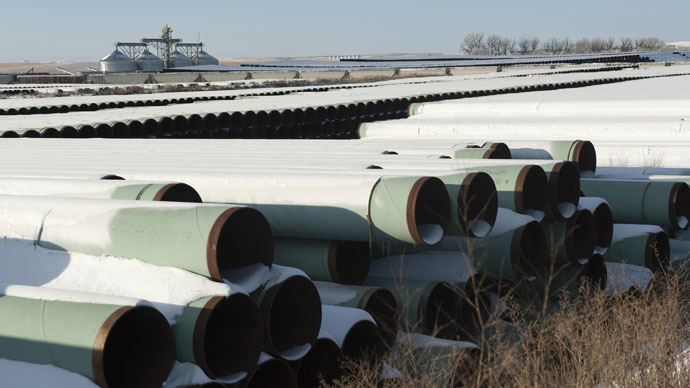 BREAKING NEWS: Senate votes 62-36 in favor of the Keystone XL pipeline bill. The bill now moves into the reconciliation process with the House of Representatives, which passed its own bill approving the pipeline earlier this month. Previously, the White House resisted attempts by Congress to force the president to make a decision. In 2012, Obama vetoed a proposal supporting the pipeline, but the project’s developer, TransCanada Corp, then reapplied. Now environmentalists are urging the president to reject it again, as they argue it will make it easier to drill for oil in Canada’s tar sands – a dirty process which burns a lot of energy in itself. The State Department is also seeking input on the project's potential environmental fallout from the Environmental Protection Agency and the Interior Department. The project has also sparked opposition from Native American tribes, particularly those living on Nebraska land that the pipeline is expected to run through. Supporters of the pipeline argue that its construction will create jobs and boost the United States' energy independence. Construction is estimated to create thousands of jobs and contribute a few billion dollars to America's GDP. However, only some 50 people would be required to maintain its operation. "The fact is, Keystone would create only 35 permanent jobs -- a drop in the bucket," said Sen. Charles Schumer (D-NY) to the Huffington Post. "A fried chicken franchise creates about as many jobs." The Thursday vote ended weeks of vigorous debate, which had the Senate up until the small hours of the morning on one occasion. Dozens of amendments to the bill were also considered, but only a few made it in - including one that got the GOP-controlled Senate to say on the record that climate change is real, and another two promoting energy efficiency. Both the House and Senate are expected to reconcile any outstanding issues quickly, meaning the bill could land on Obama’s desk within days. The White House insists it will veto construction proposals until an ongoing review process by the State Department is completed. For its part, TransCanada CEO Russ Girling welcomed the vote. “It’s time to approve Keystone XL so we can transport Canadian and American oil to fuel the everyday lives of the American people," he said. "We look forward to a decision by the U.S. Administration to approve the construction of Keystone XL."